Lack of water has forced East Palo Alto to freeze proposed developments that would provide jobs and help its residents economically. Critics of the system that resulted in the water shortage say it’s not by accident. East Palo Alto’s city manager says plans are currently on the table that would bring jobs, growth and even a Mark Zuckerberg funded private school to a community that hasn’t shared in the prosperity of its affluent neighbors along the Peninsula. The only thing stopping them: A lack of water. East Palo Alto is currently using 100 percent of its water allocation from the San Francisco Public Utilities Commission (SFPUC). That means the city has had to put a freeze on 11 new expansion projects because there’s not enough water for those projects once they are built. With very real opportunities to bring jobs, tax revenue and growth in reach, the lack of water has frustrated city officials, private developers and venture capitalists alike. “It’s the lack of water access in this city that is a surprising barrier to the economic development of this place,” said Bay Area venture capitalist Stephen DeBerry. DeBerry, who is investing in several East Palo Alto projects, is the founder and chief investment officer at Bronze Investments, a company he founded out of an East Palo Alto home in 2009. DeBerry sees opportunity in the city he says has been left behind by the whiter, richer communities of Silicon Valley. But the lack of available water for development stands in the way. According to US Census data, East Palo Alto’s population is more than 76 percent Hispanic and African American. The average household income in the city is two-and-a-half times lower than its neighbor Palo Alto where more than 86 percent of residents are white or Asian. The origins of the predicament East Palo Alto finds faces today goes back more than 30 years, when the SFPUC agreed to provide 184 million-gallons-per-day (mgd) of water to a group of 26 cities, water agencies and private utilities in the Bay Area. While the SFPUC provided the guaranteed supply, it was left up to the group to divvy up the water amongst themselves. The agreement required separate actions by each of the 26 governing bodies. East Palo Alto was a given a small permanent allocation of 1.96 MGD, an amount they’ve exceeded several times in the past 10 years. The Bay Area Water Supply and Conservation Agency (BAWSCA), enabled by the legislature in 2003, currently represents the interests of those 26 wholesale customers. BAWSCA’s CEO Nicole Sandkulla acknowledged the urgency of the situation for East Palo Alto in an interview with NBC Bay Area and a public statement recently released by the agency. East Palo Alto city manager Carlos Martinez said it’s a problem the city can’t conserve their way out of. 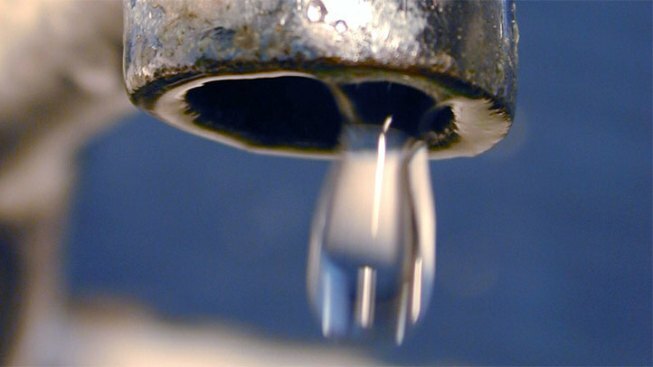 The city already uses less water per capita than any other city within BAWSCA. For example, East Palo Alto uses only 56 gallons of water per person per day, compared to the town of Hillsborough which uses more than 300 gallons per person per day. Martinez said the city is expanding its own groundwater supply by bringing two wells into production, but those projects will take several years to complete and the city has projects ready to build immediately. The city has also requested the SFPUC provide an additional 1.5 MGD guarantee to East Palo Alto on top of the 184 MGD it already provides the BAWSCA agencies. Yet the SFPUC says it’s not inclined to increase East Palo Alto’s allocation because the BAWSCA agencies as a whole have enough water to go around. 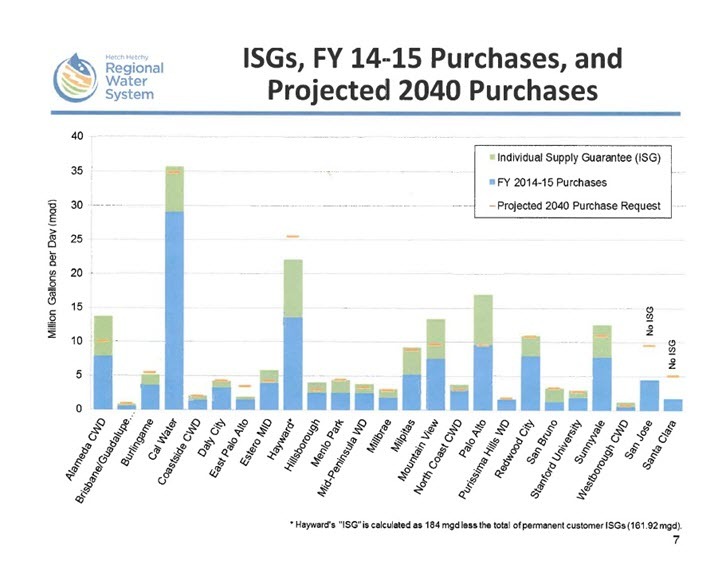 In fact, the SFPUC points to projections showing BAWSCA won’t even be using all of its 184 MGD allocation by 2040. Steve Ritchie, Assistant General Manager of Water Enterprise for the SFPUC, said the agency can’t justify expanding BAWSCA’s allocation given those projections. Instead, he said East Palo Alto should to come to an agreement with another BAWSCA agency. State Senator Jerry Hill recently wrote a letter to the SFPUC supporting East Palo Alto’s request for an addition 1.5 MGD, but he concedes it’s more likely the city will have to secure a water transfer from another BAWSCA agency instead. He said he’s willing to help facilitate that process given the importance of expansion for East Palo Alto. Hill said public officials didn’t always see East Palo Alto as a city with potential for growth and development, which helps explain why they got such a low water allocation in the first place. He said that was a mistake - one it’s time to correct. DeBerry said he hopes neighboring cities that use significantly more water than East Palo Alto will step up. “The neighboring communities, who are using up to six times more water than East Palo Alto, many of them have a surplus of water that they’re not even using,” DeBerry said. Some cities have already expressed a willingness to work with East Palo Alto on some sort of water transfer. Mountain View’s city manager recently wrote a letter expressing willingness to work with East Palo Alto to address the city’s long-term water supply. The letter stated Mountain View was hopeful it could transfer .5 MGD to East Palo Alto, enough to alleviate the immediate development freeze. Palo Alto’s city manager James Keene also said his city is also exploring a potential deal with their neighbor. DeBerry said he’s hopeful these agreements will come to fruition, but he doesn’t want to wait years to see it happen.